Do you have an overly-active dog who’s in need of constant attention? Is your arm continually sore after throwing that sticky tennis ball for the hundredth time? We all share an unquestionable love of play-time with our canine companions, but sometimes our physicality just can’t keep up. Luckily, there is finally a solution: The GoDogGo Fetch Machine for Dogs. This amazing invention works with nearly every ball type. If your ball is between 1.75 and 2.5 inches, GoDogGo will send it flying. 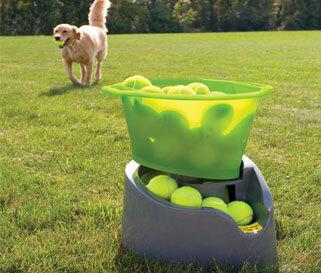 This includes every size and brand of ball from the standard tennis ball to a Kong Air Squeaker. As a devoted dog-lover, there’s a good chance you’ve got a few tennis balls lying around; if not, don’t worry. You’ll have no trouble finding the perfect ball to pair with your thrower. The unit does come with three GDG standard tennis balls to get you started, so the fun can begin immediately upon receipt. It’ll Go the Distance, any distance! Complete with three distance settings, GoDogGo can send balls soaring to as far as sixty feet. If you’re hoping to use this machine indoors, then opt for a heavier and larger ball so the GDG can keep the distance to between seven and ten feet. It’s important to note that this machine employs Safety Arc technology, making it only suited for high ceilings. Depending on the size and weight of your ball, launch distance will vary, giving you the freedom to choose the dimensions that will match your preferred distance. If you’re looking for a ball that’ll really soar, the Tuff Tennis Ball or a Spaldeen High Bounce are your best bet. When adjusting to the high setting, they are known to travel as far as sixty feet. If you’re hoping to reduce the distance of your throw, simply switch to the low setting and choose a heavier ball. For distances of roughly seventeen feet, this GDG launcher offers a HeavyWeight Med Ball that’s perfectly suited for the machine. To further shorten the distance of the throw, go for the ProPenn Tip 2 Trainer Ball, and you’ll end up with about a nine-foot throw. The thought of fast moving objects being hurled towards your dog may set you on edge. Fear not, for the GoDogGo Fetch Machine has applied a Safety Arc feature that is designed to keep your pet out of the direct launch pattern. The balls are launched in a diagonal pattern upwards to keep each ball from harming your dog. Additionally, GoDogGo has incorporated an Auto-Stop feature that senses the weight of the ball in the machine. This is to ensure that it’s not running continuously. This pair of advanced safety features will ensure the protection of your furry friend, and provide you with piece of mind. GoDogGo has included three different time settings aimed at optimizing each launch according to your pet’s rate of retrieval. Running at either four, seven or fifteen seconds, your dog will have plenty of time to retrieve that ball and set up for the next throw. Want to insert GoDogGo to your daily fetch routine while still joining in the fun? This machine comes with a remote control for on-demand ball throwing. With the push of a button you can deliver custom ball launches over and over for endless fun. You and your dog will enjoy the hours of entertainment that the GoDogGo Fetch Machine provides. With its customizability and safety features keeping all dog-types in mind, this is truly the premiere ball throwing product on the market. If you are interested in overcoming the struggle of sore arms brought on by repetitious ball throwing, then consider this an expensive, yet worthy investment. These contraptions are not cheap. At over $130 plus shipping, the GoDogGo is a luxury. It’s up to you to determine whether the appeal outweighs the price tag. Additionally, if you’ve decided this is the fetch tool for you, be prepared to wait. The GoDogGo is frequently out-of-stock and unavailable on amazon. The creators routinely have trouble keeping up with demand, and as a result, consumers are often left to keeping with their fetch routine or opting for a different brand of ball thrower. Ultimately, you’ll be amazed at your dog’s intelligence when he or she begins putting his own balls in the GoDogGo bucket. It will be entertaining for your pup and for you. Many dog owners have found this product to be worth both the money and the wait, and swear by this product’s capabilities. The ability to adjust the distance and the rate of launch will make for infinite entertainment and adaptability for the life of the machine. Suitable for all shapes and sizes of dog, now you will have the option to give your canine a daily workout without exerting too much effort of your own. Your dog and your forearms will thank you! Previous articleReview: iFetch Too – Launcher of Choice for Big Dogs?